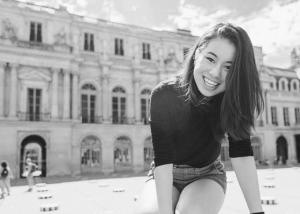 We recently caught up with SAI Ambassador Alina, who answers some questions about her time in Paris. You’ll be wasting a ticket if you travel abroad and stay in your comfort zone. Try all the local food you can. 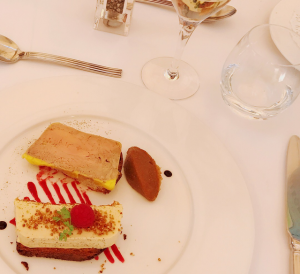 If you’re going to Paris, I personally suggest to get your fill of pain au chocolats (croissant-like bread filled with two sticks of dark chocolate), coffee eclairs, strawberry and lemon tartes and high-quality fois gras, if your budget allows. On a deeper level, my best advice is to use your year abroad to challenge yourself and stay as far away from Netflix as possible. Instead, use that time to wander throughout the city and find your own parks and havens. This may seem like a given, but be intentional with what you want to do while studying abroad. Whatever you’re goals are, set them clearly before getting off the plan. The time will go by faster than you think. But I also advise against going to the other extreme of “country hopping” and travel so much that you forget about your home city. Sure, you may end up with another album of cute Instagram pictures. But will you really have gotten to know the city you paid so much to live in for a short duration? In the end it’s your personal choice, but definitely go in with at least a frame of what you’re trying to get out of the experience. What is your favorite memory from your year abroad? 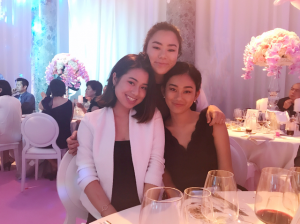 Two months after I finished school for the summer, my family, whom had I not seen for a year, flew into Paris for a family reunion with my dad’s side of the family to attend weddings and endless get-togethers. It was so rewarding to tour my family through a city I was a complete stranger to just 9 months ago and watch their reactions from the other side. During these moments I realized how much I assimilated into my new city. 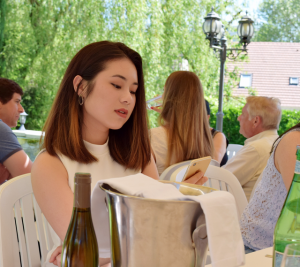 These experiences, even some as simple as ordering in French as we sat on a cafe terrace sampling a cheese platter, made all the stressful, lost-in-translation moments from the past year feel trivial. Sometimes it takes a breath of familiarity to realize how much you’ve actually grown and learned. Being able to see my progress through the eyes of my family at the end was the best part of my year abroad. Fillin’ up on Fois Gras! This resturaunt is le Moulin de la Reillère in Giverny. Eat here during day trip to Monet’s garden. What is your top tip for study abroad students learning the language? My best suggestion when it comes to learning the language of the land is to take your classroom outside of the outside the school and into the streets. In other words, learn the language by interacting with locals. I’ve met too many friends who’ve spent years learning a particular language, only to realize how little they know when they actually try to apply what they remember in the said country. I had even less to start off with when I studied abroad. Before I went to Paris, I did not speak a word of French except for, “Bonjour” and “Merci”! 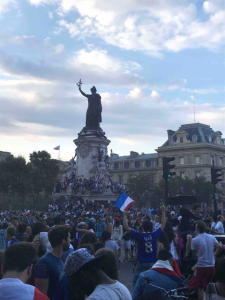 After a year, to the credit of countless French friends (and family members as well in my case), I was able to understand most conversation and could communicate sufficiently. But this didn’t come easy. During my first semester, I tried to rely on the French class at my school and found myself stuck memorizing endless verb conjugations and honestly, struggling quite a bit. What do you do in Paris? (A: Eat. A lot. To my own dismay, I found myself lacking confidence, as I was unable to practice my pronunciation or phrases in class due to the number of students and our varying proficiency levels. The second semester I was there, everything turned around as I began learning French with a local outside of school. I given the opportunity to overcome the fear of sounding ridiculous and was forced to spit out whatever French I knew with French friends I made; they graciously corrected me over and over until I progressed. Within two months, I improved exponentially more than I had in an entire semester. All this to say, I discovered the hard way that learning a language is done best by simply interacting with locals. Practice and don’t be afraid to say words wrong! You’ll find more mistakes than successes the first [many] times. But if you keep at it, the language can be yours before you leave. C’est vrai! Alina was an SAI Paris 2017-18 student from Baylor University.